We're not all cupcake artists, and sometimes it's hard to find the time to decorate a beautiful cupcake for a party or holiday. 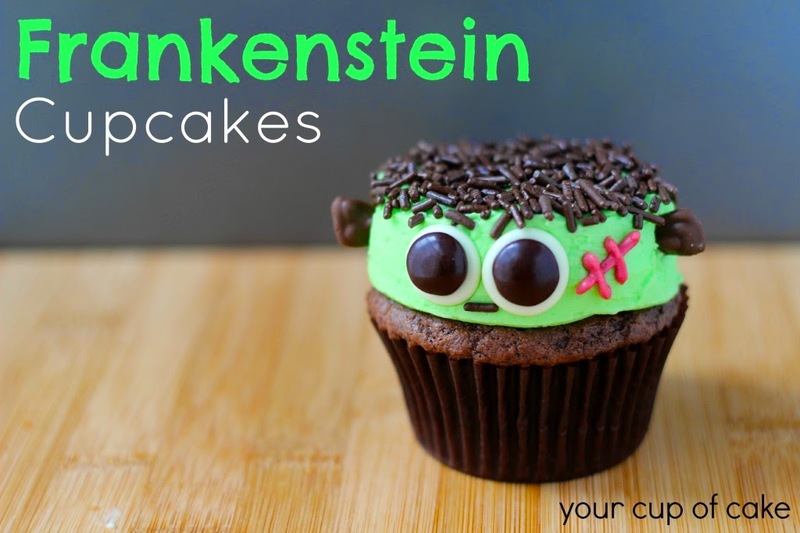 So I combed the internet for some easy Halloween cupcake decoration ideas, and I've compiled them in a little round-up below! 1. Frankenstein Cupcakes from YourCupofCake. Cute little Franks, no? She gives you such a great tutorial on how to make them, too. Ya gotta love that. 2. Pumpkin Cupcake Cake from KraftRecipes. 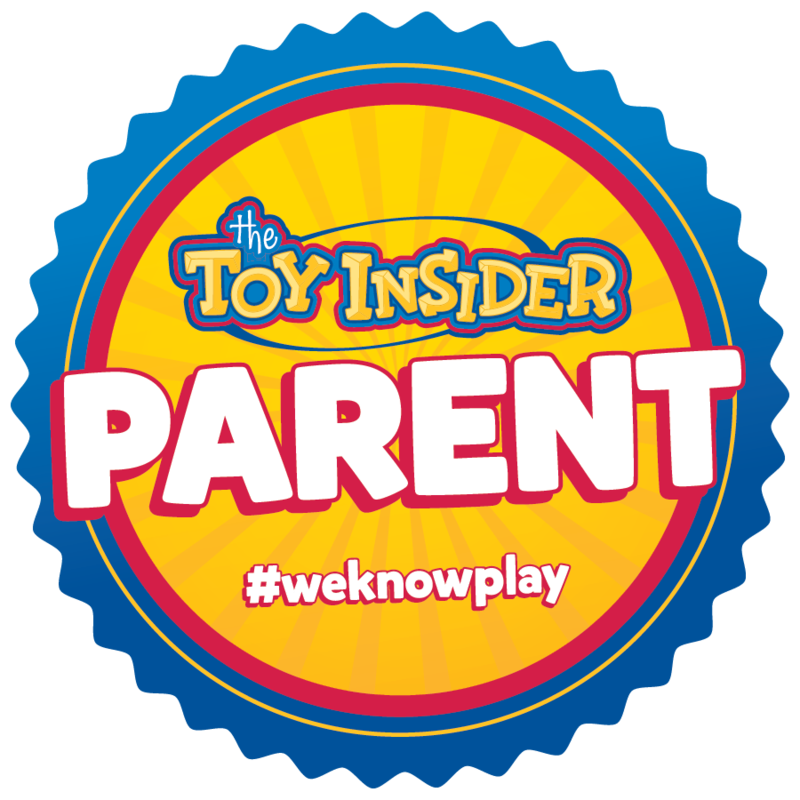 It's not as difficult as it looks, and it's such a neat idea to think you can pull it apart! 3. Ghost Cupcake Cones from ConfessionsOfACookbookQueen. I love that these are so easy to pick up and eat. Is it a cupcake? Is it a cone? It's whatever you want it to be! 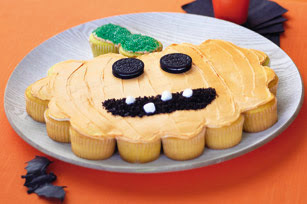 However, if I'm making these for kids, I just might not use as much frosting, 'cause that would be a BIG mess for the lil' ones, you know. 4. 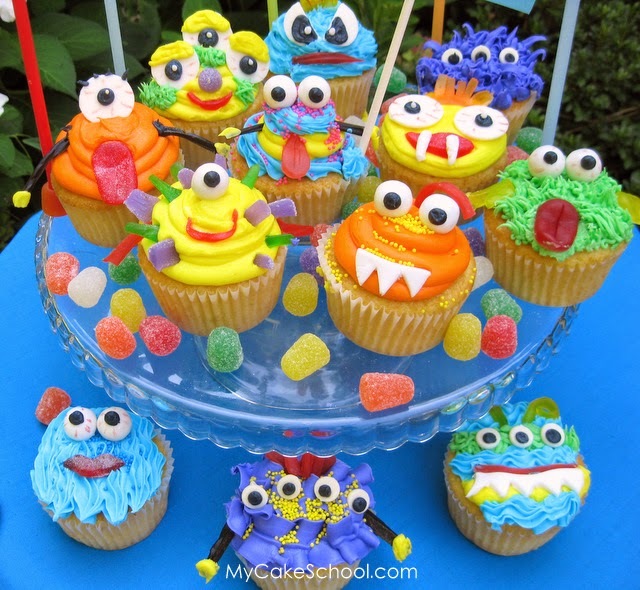 Monster Cupcakes from MyCakeSchool. 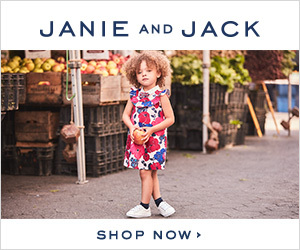 Okay, so these are really, really cute, and maybe you're thinking, "I can't do THAT!" but sure you can! They might not look exactly like these, but if you follow her steps, chances are they'll be pretty darned close. 5. 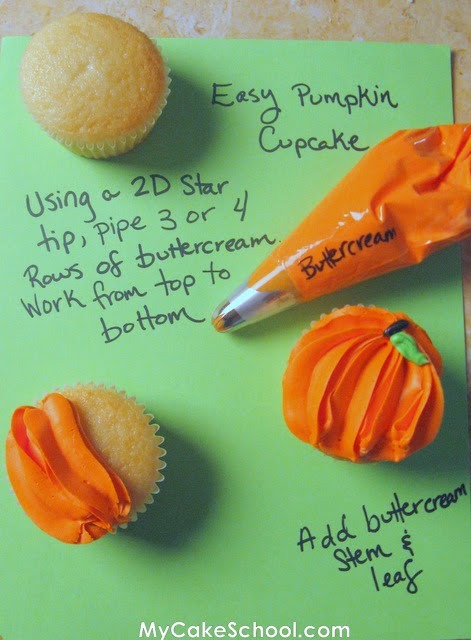 Easy Pumpkin Cupcakes from MyCakeSchool. I like you, My Cake School! You give fabulous tutorials. Your directions are so simple to follow. What more can a momma ask for? 6. Candy Corn Cupcakes from TheCurvyCarrot. 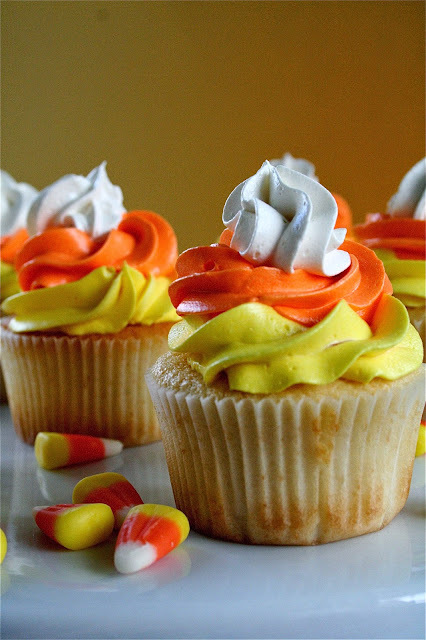 I know there are recipes out there where you can actually dye the batter the color of candy corn (see my tutorial on dying cupcakes here), but this seemed a lot easier to me, and just as cute. 7. 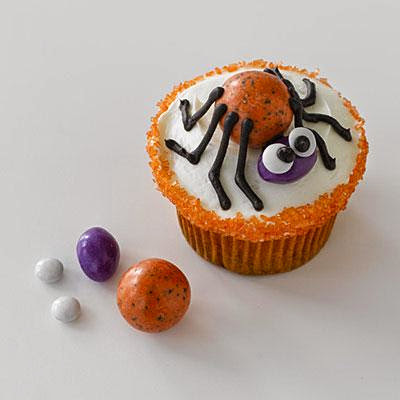 Spider Cupcakes from AllYou. I liked these spider cupcakes because they were different from all of the others that I saw, which mostly entailed using black licorice for legs. I liked that you could just stick candies on these for a cuter effect. 8. Scarecrow Cupcakes from BetterHomesAndGardens. 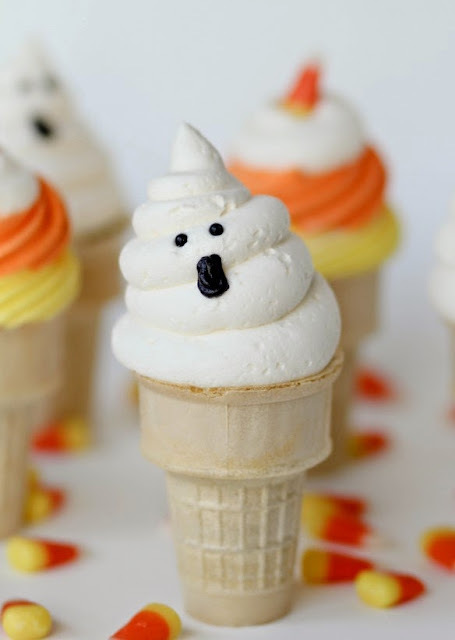 I don't know if kids will really eat the cones, but it sure looks cute! 9. 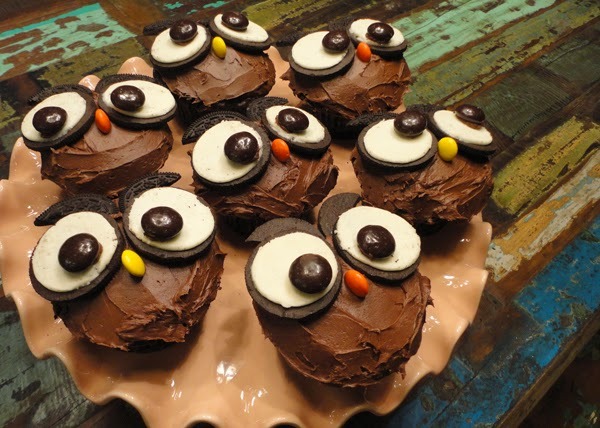 Owl Cupcakes from CatchingFireflies. I think these were originally from the Hello Cupcake series of books by Karen Tack and they are SO easy to make, just maybe a little time consuming. Catching Fireflies has a great tutorial on them. 10. 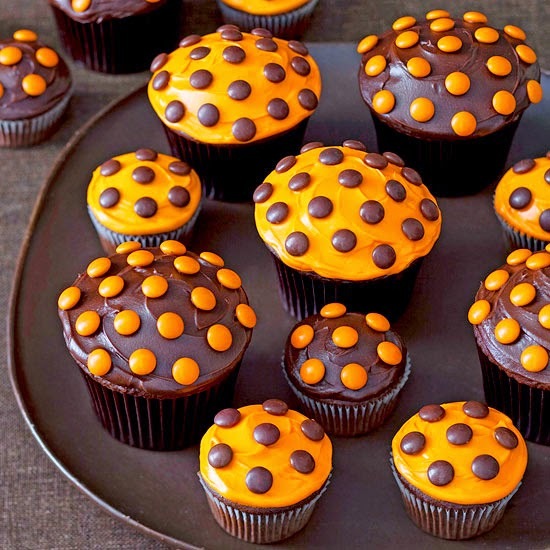 Halloween Polka Dot Cupcakes from BetterHomeAndGardens. 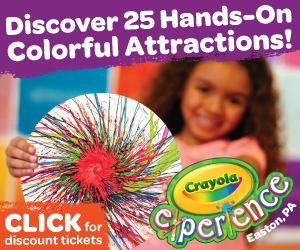 Pretty basic, and look even cooler if you make them in varying sizes! 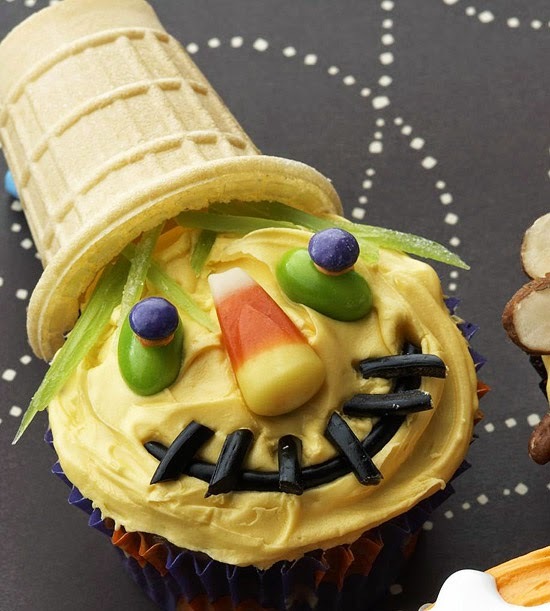 Of course, if you want to stick to what I call 'old faithful,' you can just buy yourself a box of cake mix, some cute cupcake liners and some festive sprinkles, and you've got yourself a pretty little Halloween cupcake, too. Wondering how I got my frosting to look so nice? I used a cupcake decorating gun. I included some Amazon affiliate links for them below. So easy to use, and they make your cupcakes look really professional!